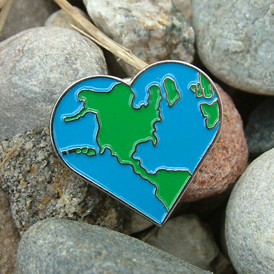 Show your support and remind others to recycle and go green with this heart shaped Earth pin! Orders received by 12 noon CST will be shipped out same day. If an item is out of stock, delivery will be in two weeks. If the item you want is not shown here, BizPins can work with you to make a custom piece from your artwork. Please call for details. I have worked with you in the past and you have been a great company to work with. I like a supplier that works like I do, worried more about the client than themselves. © Copyright 2009 - 2019. BizPins Inc. All rights reserved.